Yippee–here it is–Day number 1. I think this necklace actually was the first thing that I made in my jewelry-making frenzy to fill Allie’s Advent Calendar. 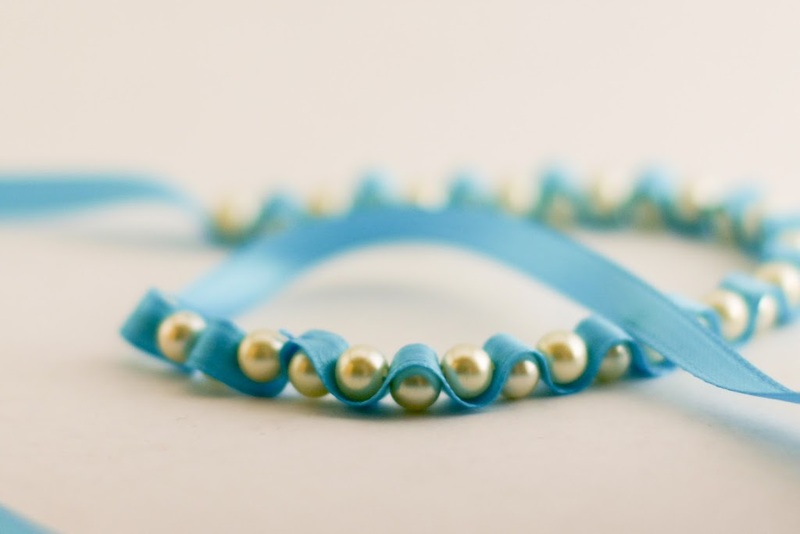 I love the blue next to the pearls and love the lines the undulating ribbon and smooth pearls make together. This ribbon strand ties in a bow in the back to whatever length your little girl desires. The overall length on this one is 28″, but with the bow, she can shorten it to whatever length she likes. The necklace is super easy to make. It took less than 30 minutes to so. The pearl beads and ribbon are from JoAnn’s. I thought I couldn’t get better than the blue until I made the sample for the easy diy tutorial below – I just ADORE the green. 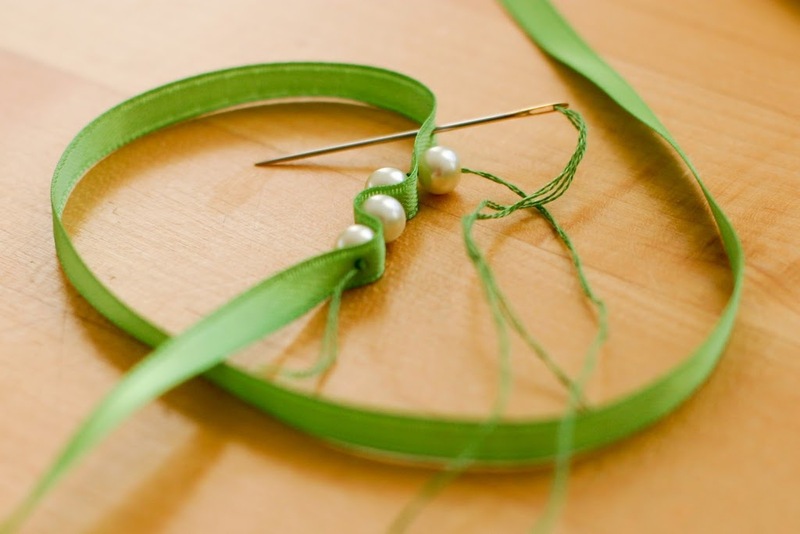 Cut your ribbon to desired length, adding enough length to flow in and out between the pearls. I used approximately 34″. 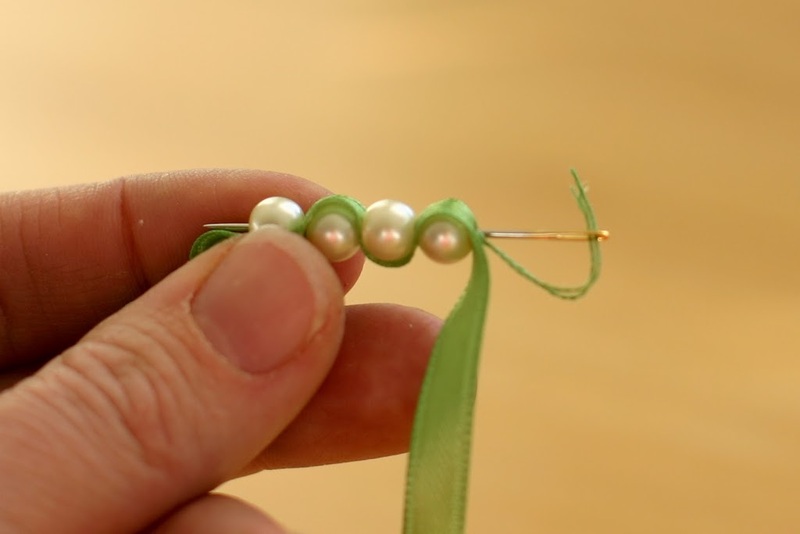 Knot a length of floss, leaving extra tail before your knot that can tied off back through some of the pearls when you are done. 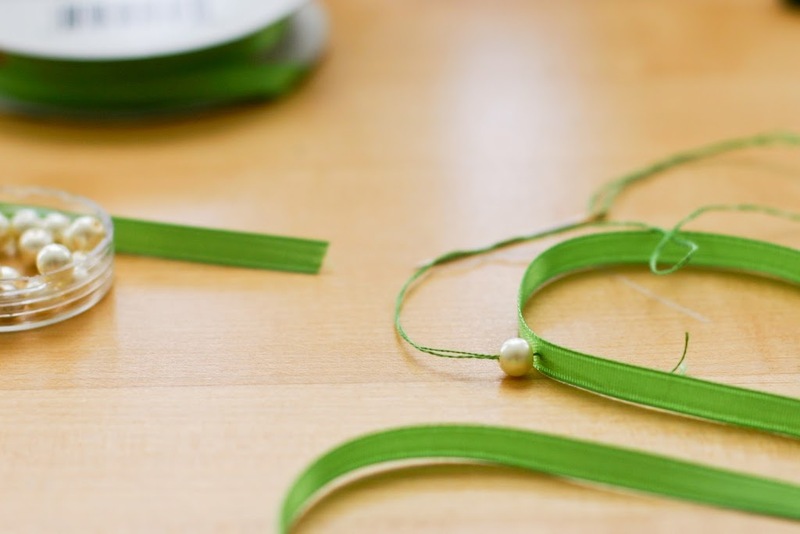 Pierce the ribbon in the middle of its width approximately 9″ along your piece of ribbon. Thread on a pearl. 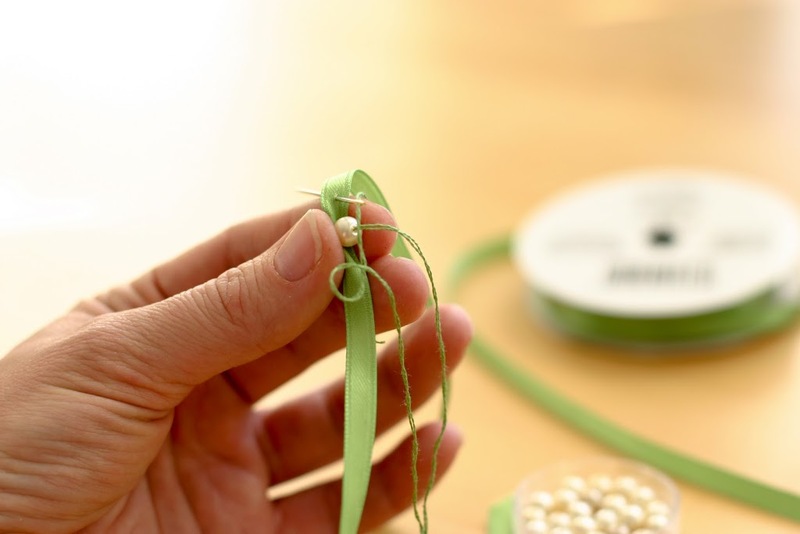 Bend the ribbon around the pearl to judge where you should put the needle next. 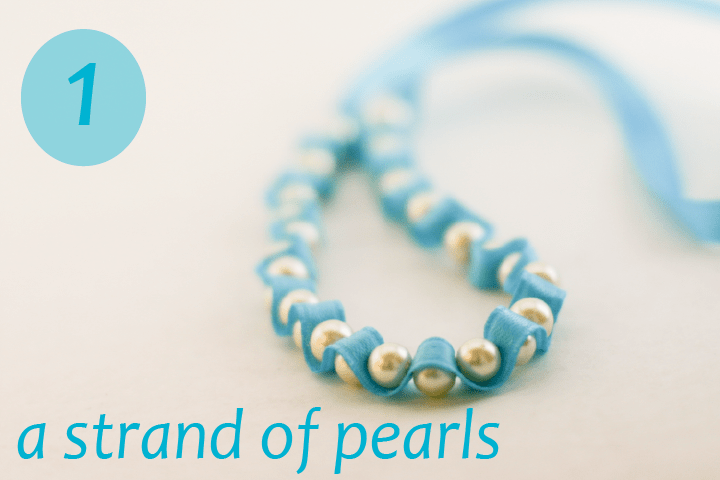 You want the ribbon to wrap tautly around the pearl without gapping, but not so little the pearl bulges out. Depending on your pearl size, it should be about 3/4 of 1 cm. Getting this right takes a little bit of practice, but you’ll get it quickly. Put on the next pearl. 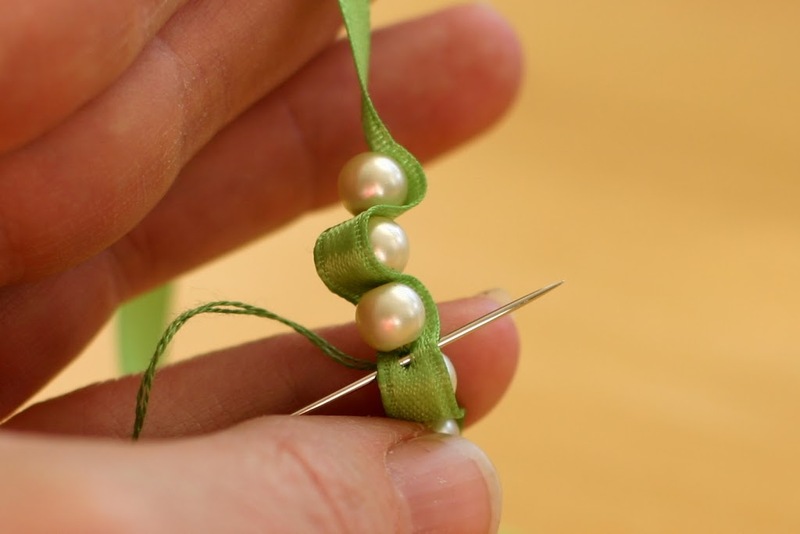 Continue to alternate between threading a pearl and wrapping the ribbon until you reach your desired length. 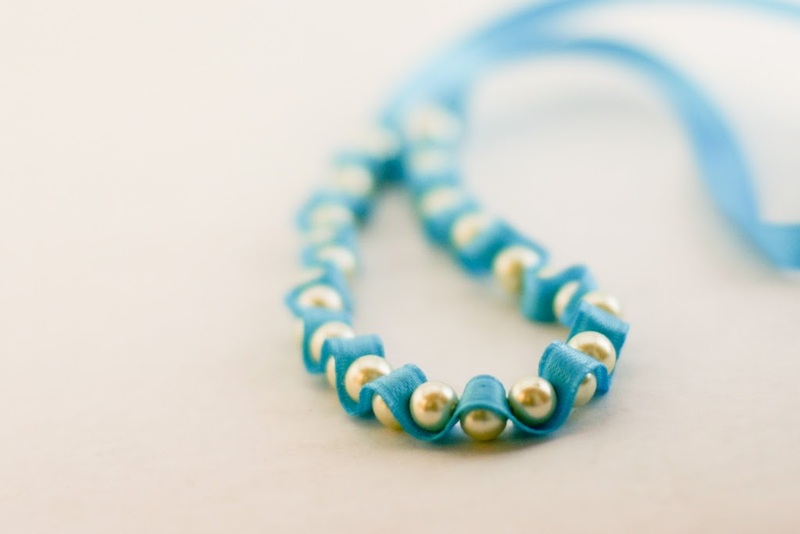 The pearl part of the blue necklace shown above is about 8″ (32 pearls). Its overall length is 26″. 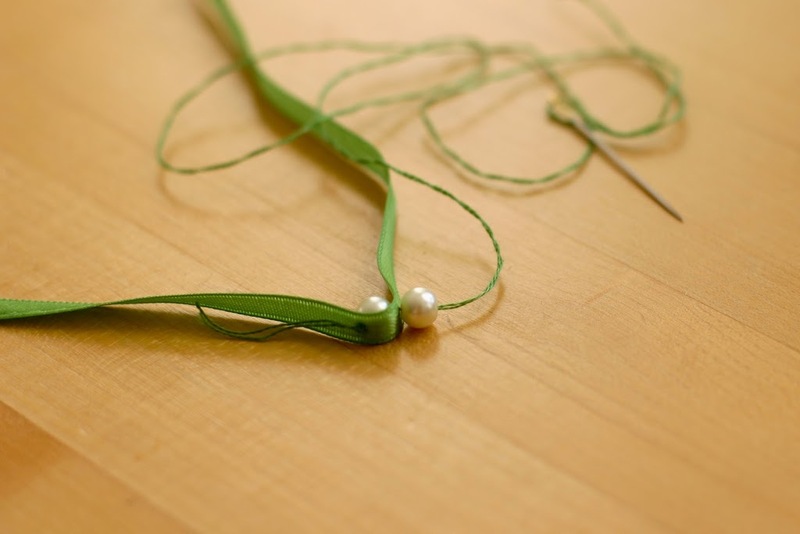 When you are ready to end the necklace, bring the floss back through the bent ribbon and through a couple of pearls. 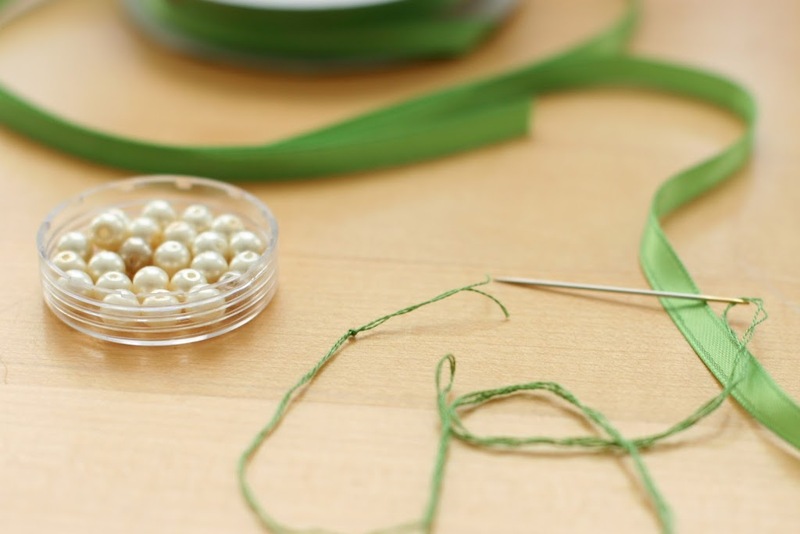 Secure the floss off hidden underneath a pearl as much as possible. 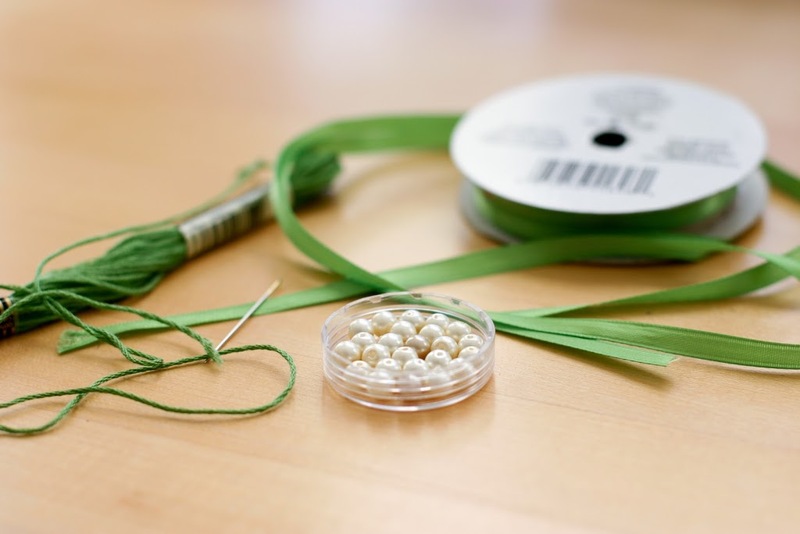 Go to the beginning of the necklace and pull the tail end of your original knot through some of the pearls and secure. Finis. I hope Allie loves it. A beautiful coral, bow bracelet is coming up tomorrow, so don’t miss it! Question – do you think this is do-able as a kid craft? I was thinking that my kids might like to make them for their aunts. What a great idea, Susan! I do think kids could do it. 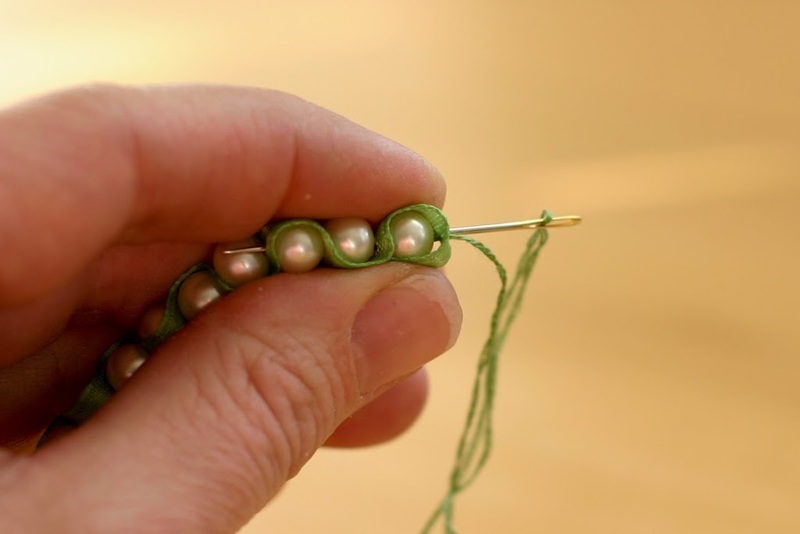 Its simple threading of beads. 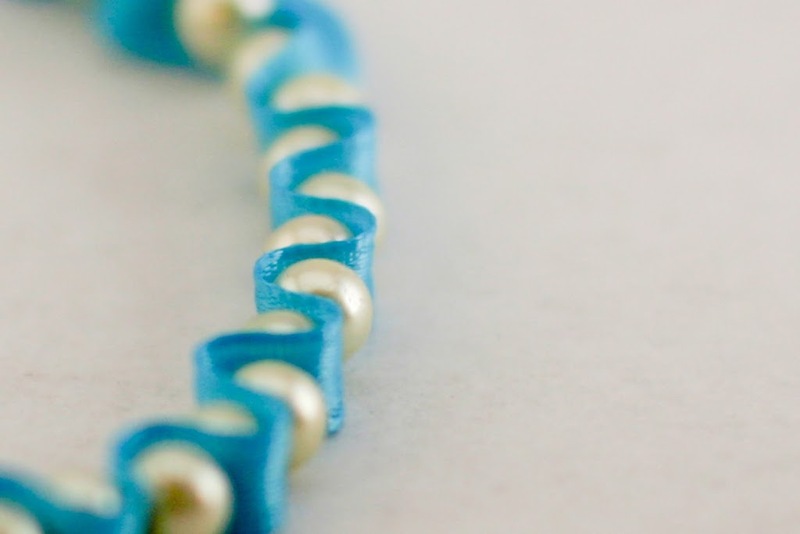 The only tricky part is spacing the ribbon around the bead. This just takes a little practice. If its not exactly right the necklace will still look great. love this! I think you’ll be giving me a handful of stocking stuffer ideas, Anne. your tutorial is absolutely adorable, thanks so much for sharing!! I had my three and five-year-old make these for both of their grandma’s December birthdays. I thought that I would have to do most of it, and just have them help, but both of them ended up doing nearly everything themselves! What a wonderful idea! They loved it! We can’t wait to try some more of the daily ideas! I made a necklace and bracelet for my sister, used dark blue ribbon and creamy pearls. looks so rich!!!!! Thanks for the tutorials, great ideas! Oh my goodness! I love this necklace! So so cute! I can’t wait to try it – I’m going to go see what supplies I have it craft it up, tonight! Oh dear! I am so sorry that you had tears and found the project difficult. Not what I intended in any way. I hope things worked out for you. Many times I have projects that just don’t work out, so I feel your pain. Thank you for giving it a whirl! 🙁 Too bad people do things like this. THanks for such a lovely tutorial! argh! I’m appalled. Thank you so much for taking the time to let me know. This is very frustrating! Please forgive my big mouth, Anne! I realized as I went further into your blog that shantea mac had indeed used one of you pictures on her page without crediting you. Sorry, I hadn’t seen your picture with that variation yet! You have a great blog, and I’m gonna shut my mouth now. Kelsey, It was not a similar idea that she had posted, but literally six, SIX! of my tutorials posted with every word I wrote and every photo I took! I complained and got them removed. It may be totally cleaned up now, but I refuse to give her one more page hit! Thanks for your thoughts. Love this!!! Going to try one or several out today! Thanks so much for this lovely tutorial, Anne! I love BOTH the blue and the green – so fresh and bright! I love this tutorial! I want to try making a few different versions of that when I get some free time! Thanks for posting it.